The idea of applying ITIL best practice outside the domain of IT Service Management is not new, and providers of service management systems have been offering solutions for providers of non-IT services for quite some time. The question that is to be considered: Can the guidance provided by ITIL be used to look on a broader scale outside of IT organizations? ITIL being viewed as applicable and part of IT as it has initially evolved for the IT Industry. Another reason could many find ITIL big and complex for their purposes. ITIL as a Best Practice framework is descriptive while non-prescriptive leaving the flexibility and freedom to Service Provider organizations intending to adopt what suits their Business Requirements. So, now we are here, at a point where opportunity exists for non-IT Service Providers too to adopt ITIL practices & why not? ITIL as a Best Practice Framework prescribes guidance and guidelines specifically for IT service providers, which makes everyone else wonder if ITIL is right for them? Business priorities and outcomes vary across every organization, so it is not feasible to have a one-size-fits-all approach. What is more important is to get started. Policies and procedures do not have to be perfect the first time. Waiting for the ideal process may involve delays, thereby leading to uncertainties. In today’s world of buzzwords – Agile, Disruption, CXI (Customer Experience Index), etc., the wait time is not worth the realized efficiencies and ROI if the route involved the adoption of ITIL. The need is to look at the relevance and VALUE to identify where to focus and what to adopt and adapt. Improve the alignment between IT and business, providing services that meet the needs of their customers. Improve the quality of the IT services delivered by better understanding the requisite levels of security, availability, capacity, and continuity, and then planning solutions, eliciting the lifecycle from Initiation to until End-of-Life for the Product/Solution/Service. HDI did a Survey and ITSMF USA in July-August 2014 and Responses collected from 1197 IT Professionals on the topic, ‘Service Management: Not just for IT Anymore’ (Reference section has links for further reading). 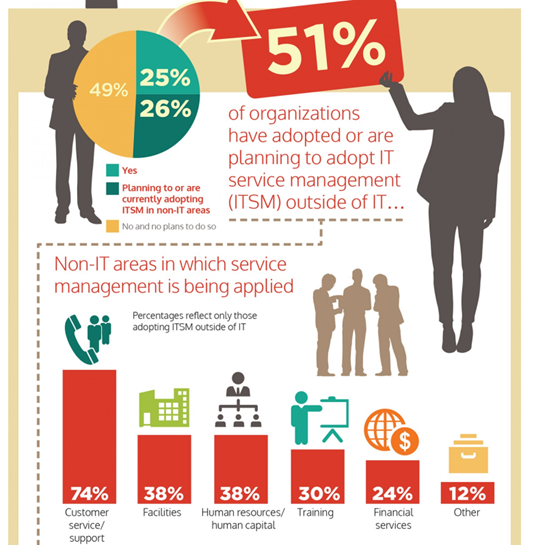 51% of Organizations have adopted or planning to adopt IT Service Management outside of IT. Non-IT areas of adoption included Facilities, Human Resources, Training, Customer Service/Support, etc. See Figure below for more details. You can find the references at the end of the blog. Most common ITSM Processes adopted Incident, Knowledge, Change, Customer Relationship Management, Service Catalog, Problem Management and Asset Management. 87% of Organizations or using or have plans to use a Service Management Solution (tools), with ServiceNow in the lead. Biggest driver to move ITSM outside of IT was stated as expanded capabilities of technology with 61% influenced by it. IT organizations can make use of ITIL and decide for themselves what aspects to adopt. Some IT organizations may decide to adopt only the operational processes, like incident management and change management. These processes do provide some value, but they are only a small part of the whole ITIL framework. However, to get the best value from ITIL, adopting a lifecycle approach to ITSM is suggested. This covers everything from the overall IT Strategy to Design, Transition, Operation of services and Continual improvement as a life-cycle stage at large and aspects of improvements as applicable to rest of the Lifecycle phases, Strategy, Design, Transition, Operation and CSI as well. When the organization decides to adopt a best practice framework, most prudent strategy is to understand the approach that will be a good fit for the organizational culture and to incorporate it into their management system in the best manner. It does not help to adopt a rigid set of processes, with no understanding of how they would fit within the culture of the organization. The appropriate way to use ITIL is summarized in the phrase “adopt and adapt.” – adopt the areas that are needed, and adapt the ideas to fit the environment rather than blindly following the guidance.